Is that hunting trip coming up in another state? Maybe you’re even planning on taking your gun out of the country on a hunting trip in Africa? Regardless of your purpose, we are here to help you with a smooth transition from the airport to your destination with your firearms intact and still within your possession. Flying, in general, can be quite overwhelming and some people believe that flying with firearms is just going to be even more complicated. Although there are some extra steps and additional things to think about, it can actually be quite an easy process! The airlines are even set up to be able to assist you with getting your firearms onto the plane. Read through these tips and by the time you’re done you’re going to be flying in no time! Tip #1 – It’s NOT A Carry On! The first thing, and probably the easiest to understand is that the airlines will not allow you to take the gun on the plane as a carryon. It’s not just guns – the airlines aren’t going to allow you to take on any sort of weapon onto the plane. They even limit the liquid you carry on because a group of people managed to turn a sports drink into a bomb one time. The firearm itself needs to be in a locked and hard-sided container. You are allowed to keep ammo and magazines in the same container, but not in your carryon. If it’s not stored in the same case it is required to store the ammo and magazine with the same restrictions as a gun so it’s best to just keep them together for the flight. Any case will work it is just mandatory to be hard sided and lockable so that unauthorized individuals won’t be able to gain access to the gun. Also, it’s a good idea to get a secure case to be able to hold your ammo, like one of the special cases that snap shut to avoid them spilling everywhere. Gun powder and primer is simply not allowed on the plane, checked bag or not. Airlines say it’s ok with TSA regulations to leave the bullets in the cardboard container that they come in. We would say to make sure to get a plastic shutting case because those cardboard boxes aren’t going to be able to handle the beating of going through the airport checkpoints. If you can’t get a plastic case, at least tape up the cardboard box so that ammo can’t escape the box. Firearm parts like bolts and firing pins are fine to keep in carryon bags. Also, if you’re concerned about your optics you can always remove it from the firearm and carry it on to the plane as well. It’s also good to know that you can keep multiple guns in a single case. If you don’t own a hard-sided case or gun container and don’t want to buy one you can always ask one of your shooting buddies if you can borrow one! You need to understand that you keep the combination or keys of the lock to yourself. It is against the law for TSA agents to ask you for the combination or even have access to be able to unlock the gun case. In this scenario, you do NOT want to use TSA approved locks. All TSA agents have access to a master key to be able to open the approved locks but they should not have access to your firearm. Whatever type of case that you are using for your firearms doesn’t matter but make sure to just put a lock through each and every hole of the case. This will save you any a headache if a TSA agent wants to try and state that the case isn’t secure enough. Also, if you’re worried about theft a lot of people will use a case that doesn’t look obviously like a gun case so as to avoid people wanting to steal it as opposed to a standard looking case. Some guns are restricted which require a special lock like a cable lock or a trigger lock for some airlines. These generally don’t include hunting rifles or shotguns. When you’re at your destination it’s best to go check the regular carousel first. 9 times out of 10 the gun case will pop out of there with the rest of everyone’s baggage. But! If you don’t see it there, don’t fret. Just go check in with the office that’s nearby that handles large and unusual items and you’ll be sure to find it there. Airlines say they have a pretty low rate of lost luggage. Even when I had an item missing it turns out that it had just gotten contaminated with some salsa so they didn’t put it on the connecting flight and I got it 2 days later. No big deal. You need to declare your firearm at the ticketing desk of the airlines your flying through. This doesn’t need to be complicated. When you’re processing your bags with the ticketing agent just let them know that you have a firearm to declare and they’ll get you started on the process. Ultimately, they’ll have you fill out a declaration card to go into the case which states you declared it officially. They will also have TSA inspect the case after you check your bags so it’s a good idea to hang out in the lobby for about 20 minutes before going through security. This paperwork is just to ensure that the gun goes in the belly of the plane and has the least chance of being accessed. Sometimes they page you back to have you open the case so they can physically inspect it and it’s just nice to wait and not have to go through security twice. Usually, though, they’ll just swap the outside to ensure that there is no explosive residue on the case. Make sure to unlock the case yourself if you are asked for permission for them to see the firearm. If the TSA or airline agent believe the gun should be physically inspected they should engage a law enforcement officer because they are actually not allowed to handle your gun under any circumstances. It’s a good idea to just check up on the regulations and rules of your specific airlines to make sure you are following all the rules before you show up to the airport. A simple google search of “<your airlines> and firearm regulations” will do the trick. Also, this is the link for TSA’s guidelines on firearms. It might be a good idea to print this off and bring it with you just so you have a physical copy of the policy that they are supposed to adhere too so you don’t run into any problems! Make sure you are absolutely clear on the laws of firearms for the destination you are traveling to. Some airports have been known to even arrest law-abiding travelers who have firearms that are just getting on a connecting flight but the firearm is illegal in that state. There is a law that protects travelers against this but even so, New York, La Guardia, JFK, and Newark have all been reported to arrest law-abiding travelers so it’s best to avoid these places with your flight plans if it’s possible. You could also have an issue where your connecting flight is canceled and you need to take your baggage to a hotel for the night. If the state you land in has laws against owning a firearm you are technically now “breaking the law” through no fault of your own. Just be aware and do your research! It’s important to follow these tips exactly. If you end up in the wrong place at the wrong time with a gun it can become very expensive even if you don’t get arrested. The fee for Albany, New York, for example, is about $3,900 and that’s for a first offense! One minor thing about international flights is to book direct flights whenever possible. This will simply cut down on the number of times it has to go through customs and having a customs agent freeze your firearm or even put the firearm on the wrong flight. A more important aspect is to ensure that you fill out a US Customs Form 4457 and have it signed by a customs official. This form will essentially prove that you already had the gun before leaving the country so you are not liable for paying a duty tax on the firearm. Also, make sure that you can even take a firearm with you to the country that you are going to. Some countries do not allow you to fly in with a firearm and if you show up with your firearm you may run into problems if you’re not aware of the regulations regarding firearms for the country you’re flying too. Tip #8 – Unload The Gun! It should go without saying but make sure you don’t leave the gun loaded when you put it in the hard case. You want to keep the gun unloaded obviously, but also make sure the magazine is unloaded too! You can store them together but not loaded up. Most airlines allow 11 pounds of ammo and 50 pounds of total luggage. It’s a good idea to weigh it at home because if you go over the weight then the airlines will charge you additional fees for it and it can become pretty expensive pretty quickly. It’s also good to keep in mind that some airlines have a limit on how long the baggage can be so make sure to check the above links to see if there are any restrictions on lengths! Because of some of the extra steps, you need to go through it’s a good idea to give yourself at least an extra two hours. This way you won’t get stuck answering questions or opening your gun case and end up missing your flight anyways. Most of the time it’s a good idea to arrive early anyway, but keep in mind it’s extra important with a firearm because of the extra steps. So now you know how to get a firearm through! So make sure you always check your gun in at the ticketing counter as well as sign the declaration sheet for the airlines. 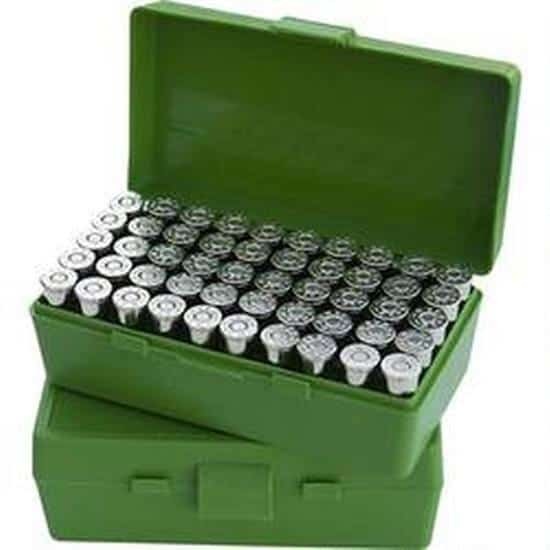 You want to make sure the gun is unloaded, but it’s ok to keep the ammo in the same case. Another key thing to know is to keep your keys with you! The TSA agents or airlines are not allowed to access your gun at all. It’s also good to know that recovering your gun can sometimes be in the location of large and unusual items as opposed to the carousel. The last things are to check with your individual airlines on what their regulation are and also to know the laws for your destination whether it’s national or international flying that you’re doing! Lastly, make sure you arrive early! This goes for an airplane flight in general and you will be flying easy for the rest of your days!